8- month-old baby Ariya needs an urgent liver transplant. She has been fighting a condition called Biliary Atresia, since she was 3 months old. She underwent a procedure called Kasai when she was 4 months old. But it was unsuccessful. Her liver has been completely damaged. Only curative option at the moment is a liver transplantation. Her family hails from Darjeeling. Her father, Amulya, has sold his restaurant, the only source of income to the family to treat Ariya. They sold their car and spent all the savings for various medical procedures. They came to Bengaluru with the last hope to saving their daughter. Ariya is admitted to Narayana Hrudalayaya and her liver transplantation is scheduled for next week. Ariya has been admitted to the hospital for the last 10 days. Her father has come here borrowing some money but that was spent for the tests and hospitalisation. Her father is found suitable to donate a portion of his liver. He underwent tests and is fit for the surgery. 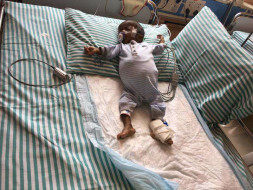 The cost of the transplantation is over 15 lakhs and the family is without any help.Ariya's life can be saved with our support. Your contribution will help this family in this crucial time. We have an update to share. As donors interest and feedback is of utmost importance to us and since a number of donors like you, have written in requesting their funds donated/raised to be transferred to Amulya's family. We have done just the same. Milaap has transferred an amount of Rs 2.85 Lakhs to Ariya's family and has generously waived off the fee as well. This was done in consultation and consent with the parents as well as the hospital (the campaign organizer in this case). We also have identified a little girl in need of a liver transplant. Her name is Benakashree and she is 5-months old. Shilpa and Suresh are from a village near Shimoga where Suresh works as an accountant. They were comfortable enough to start a family and could not conceal their joy when their daughter Benakashree was born. However, baby Benaka has Biliary Atresia. Her bile ducts are blocked due to which her liver is failing, and it is hardly functioning at this point. So far, she has been on medical management, but time's running out to save her. The transplant needs to happen by the end of June and they are waiting in on raising funds. Mr.Amulya (Ariya's father) has spoken to Mr.Suresh and has given us a consent to transfer Ariya's remaining funds to Benakashree in the name of Ariya's Memorial fund. An amount of 7,934.42$ (Rs 507,087.47) has been mapped to Benaka's campaign page here- https://milaap.org/fundraisers/help-benakashree. Please do refer to the campaign page for further information. Donors, let us keep Ariya in our prayers and bless Benakashree to help her fight this disease. Thank you all for all the love and support shown in such hard times for both the families. Once you send us the details, we will process your refund within seven days of the request. The remaining funds would be utilized for another patient's liver transplant from the same hospital. Once we identify the patient from Dr. Ashley and his team, we will be prompt in letting you know the details of the patient along with their campaign page link. The funds will also reflect in that page. We have some sad news to share with you. Baby Ariya passed away on 1/05/17 at 11.55pm. 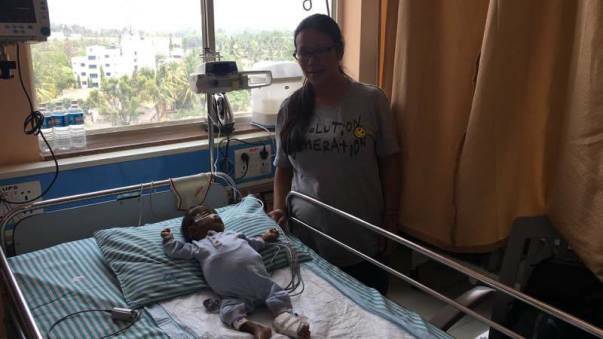 Ariya had been diagnosed with biliary atresia and was treated for the same initially but it was unsuccessful, so she was admitted with chronic liver disease and persistent sepsis. The child was poorly nourished with respiratory distress and bloated abdomen. The blood circulation was normal and no external support was required for the same throughout her stay at the hospital, but becuase of her malnourishment she was being given high calorie diet through tube feeding. Ariya also had 1 episode of heamatemesis and massive malena after which her respiratory distress worsened. 15ml/kg PRBC by transfusion and atrophic infusion, PPI infusion, was started. In view of severe respiratory distress, child was decided to be intubated and ventilated. She had a massive pulmonary bleed at the time of intubation and her respiratory pressure also shot up. The baby had cardiac arrest after live monitor, the emergency resuscitative measures were tried but she could not be revived back. We hope the family finds strength in this difficult time. May her soul rest in peace. Thank you all for showing the unconditional love and support towards her.